University of Nottingham > Blogs > Physics > Admissions > What’s so great about Nottingham anyway? What’s so great about Nottingham anyway? It’s that time of year again. The School of Physics & Astronomy (indeed, the entire University of Nottingham) is going to open up about just what makes us tick. We’ve invited prospective applicants for our courses (and their nearest and dearest) to our open days — the first of which is happening tomorrow — so that they can tour the Nottingham campus, get an insight into our teaching, research, and outreach activities, and quiz us about just why they should include Nottingham in their list of university choices. If you’re one of those visiting the School over the next couple of days I hope you interrogate us (mercilessly!) about everything from course structure, through undergraduate research opportunities, to opportunities for study abroad. Make the very best use of your time and do not be shy about putting us on the spot. 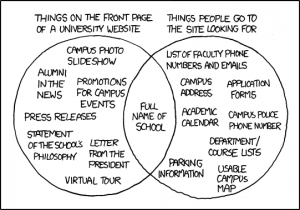 One particular trap into which academics and universities can sometimes fall is pithily summed up by the classic xkcd cartoon below. (xkcd is a firm physicists’ favourite). If you visit for an open day, make sure you get the information you need. It’s not about what we want to say; it’s what you want to know that’s key. I’ve been at Nottingham since 1994 but it’s only fairly recently (2014) that I took on the role of admissions tutor. In my three years in the job, I’ve always looked forward immensely to our open days. Nottingham is a great place to work. What could be easier than telling students and their parents about all the School has to offer? But let’s be honest here. My admissions colleagues and I have a particular vested interest in convincing visiting students to make Nottingham Physics & Astronomy their firm choice. After all, it’s our job to highlight the strengths of our School (in what we hope is a sufficiently even-handed way). Our students, however, do not have that constraint; they can tell you the unvarnished truth. Moreover, they have not only experienced our lectures, workshops, tutorials, and lab sessions, they’ve navigated all of the housekeeping issues (both literal and metaphorical) that come with doing a university degree. My key piece of advice to those who visit on open days is always this: make sure you make lots of time to talk to the undergraduates here. Yes, we’ve of course selected students who are enthusiastic and can speak engagingly about their courses; we place a great deal of emphasis on communication skills and we’re immensely proud of our graduates’ abilities in this regard. (More on this tomorrow and Saturday). But we also ask our students to be open and honest about their time at Nottingham — to answer questions with as little “gloss” as possible. So what is so great about Nottingham anyway? Ask our students. But they may well also tell you where they think we might be able to improve a little. And make no mistake, there’s always room for improvement. To suggest otherwise is dangerously complacent hyperbole. If you are indeed visiting our School (and our beautiful campus) over the next couple of days, I hope you have an informative and engaging day. I look forward to meeting you.